The year is 1992. Iran has just blown up the Israeli Embassy in Argentina, an event little remembered today. Algeria -- which last month sponsored the U.N. Security Council resolution condemning Israel's assassination of Hamas leader Sheikh Ahmed Yassin as a violation of international law -- has cancelled a democratic election that was about to be won by an Islamicist Party, declared martial law, and has sunk into what would become a ten-year civil war against Islamic radicals that featured heinous acts of terrorism, torture, mass executions, and so many "disappearances" that just last year Human Rights Watch declared Algeria to be the world leader in them. And, in the final months of the year, Israeli Prime Minister Yitzhak Rabin has rounded up 416 Hamas leaders and activists and deported them to Lebanon, dumping them on a hilltop in the no-man's land between Israeli and Lebanese lines. Meanwhile, French papers from that time also noted, invariably without comment, in small articles buried somewhere toward the back, that Algerian security forces were rounding up militants and shooting them. Extrajudicially. Needless to say, no global outrage. Time passed. Under intense international pressure, Rabin let more and more of the Hamas exiles back into Israel, eventually bringing them all back as part of the Oslo Accord in September 1993. What's become of these men, these university-educated victims of Israeli aggression? Let's check in with the Class of 1992, to see how they're doing. First, although the first Hamas suicide bomb attack dates to April, 1993, the campaign only began in earnest after the militants had all returned, in 1994. (This was the same year that Iran, via Hezbollah and with the complicity of the Argentinean police, bombed the Jewish community center in Buenos Aires, killing 87, and the same year that the radical Algerian GIA, which many have linked to the Algerian government, hijacked an Air France plane with the intention of flying it into the Eiffel Tower. French commandos successfully raided the jet and killed the terrorists.) This coincidence of timing bore out Israel's rationale for the deportation in the first place: that Hamas was now a ticking time bomb. A terrorist group of the first order. Does anyone remember this rationale today? It is impossible to know what happened to all 416 alumni of the Lebanese exile. Perhaps many of them have spent the past twelve years at home, tending their gardens. What is clear, however, is that they have had a prominent place in the suicide bombing campaign; they are not the "martyrs" themselves who carry the bombs, but the commanders, managers, and organizers of the attacks. Another alumnus, Jamal Mansour, ran suicide bomb operations in the northern West Bank, where he oversaw its implementation, targeting, and infrastructure. 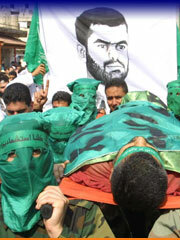 Jamal Dmouni became Hamas commander in Samaria, where he oversaw Mansour.